Dempsey, Hugh A.. "Red Crow". The Canadian Encyclopedia, 28 May 2018, Historica Canada. https://www.thecanadianencyclopedia.ca/en/article/red-crow. Accessed 20 April 2019. Red Crow, warrior, peacemaker, Kainai leader (born ca. 1830 near the junction of St. Mary’s and Oldman rivers, AB; died 28 August 1900 near the Belly River on the Blood reserve, AB). Red Crow, the powerful chief of the Blood, was one of the chiefs whose support was required for the peaceful settlement of the West. He was a signatory of Treaty Number 7 (courtesy PAA/B-1054). Red Crow, warrior, peacemaker, Kainai leader (born ca. 1830 near the junction of St. Mary’s and Oldman rivers, AB; died 28 August 1900 near the Belly River on the Blood reserve, AB). Also known as Mékaisto (Mi’kasto), Captured the Gun Inside, Lately Gone, Sitting White Bull and John Mikahestow. As head chief of the Kainai (Blood) tribe, Red Crow was a skilled negotiator. The oldest son and nephew of the band chief, he occupied a prominent position among his people. Red Crow was a passionate advocate for the Kainai. He sought improved conditions for his people in the wake of monumental changes amid the decline of the buffalo in Kainai territories in the 1860s and 1870s, the encroachment of European settlers and the disastrous effects of small pox epidemics. Red Crow was born around 1830 near the confluence of the Oldman and St. Mary’s rivers, in the heart of the Kainai hunting grounds. The Kainai are members of the Siksikaitsitapi (Niitsitapi/Niitsitapiisini/Blackfoot Confederacy), who occupied the territory between the Red Deer River to the Belly River, though by the mid-19th century, they had moved further south into what is now present-day Alberta. Red Crow was a descendant from generations of chiefs of the Blood tribe. This included his grandfather, Stoo-kya-tosi (Two Suns), who was a warrior and leader of the Mamyowi (Fish Eaters band). Red Crow’s mother, Handsome Woman, was one of Black Bear’s wives. Red Crow was raised in the care of Handsome Woman, while his education was left primarily to the care of his grandfather, his uncle, Big Plume, and a close family friend named White Wolf. Red Crow earned his grown name, Mékaisto, when he first went to war. The 1840s and 1850s were a period of intense raiding among Indigenous peoples of the Plains. As a young warrior, he established a reputation of his own, killing at least five enemy warriors and participating in over 30 raids against the Crow, Cree, Assiniboine, Shoshoni and Nez Percé. It is likely that he was involved in the 1865 attack against a woodcutter's camp in Montana. In 1869 and 1870, smallpox took the lives of many chiefs. Red Crow gained a reputation in his youth as a brave and strong warrior, and succeeded to the chieftainship of his branch of the Siksikaitsitapi in 1870 under the direction of members of his tribe. Red Crow claimed that he had never been struck in battle by an enemy, though he suffered trauma of his own making. After he killed his brother, Kit Fox, during an alcohol-fuelled argument, Red Crow became an ardent believer in non-violence. He spent the last half of his life seeking to bring peace and stability to his people as they endured harsh changes brought about by the expansionist tendencies of the Canadian state. When the North-West Mounted Police (NWMP) arrived in 1874, Red Crow sought to engage with them on the basis of respect, eventually coming to have a peaceful relationship with this arm of the expanding Canadian government. Realizing that the decline of the buffalo (bison) herds and a rise in disease threatened his people, he joined with other members of the Siksikaitsitapi to sign Treaty 7, administered under the recently established Indian Act (1867), on the banks of the Bow River. It was here, along with other members of the Blackfoot Nation that Red Crow employed a principle of self-determination for his people by agreeing to negotiate a treaty with the Canadian government under the direction of lieutenant-governor of the Northwest Territories David Laird on 22 September 1877, and in mutual cooperation with the Siksikaitsitapi. 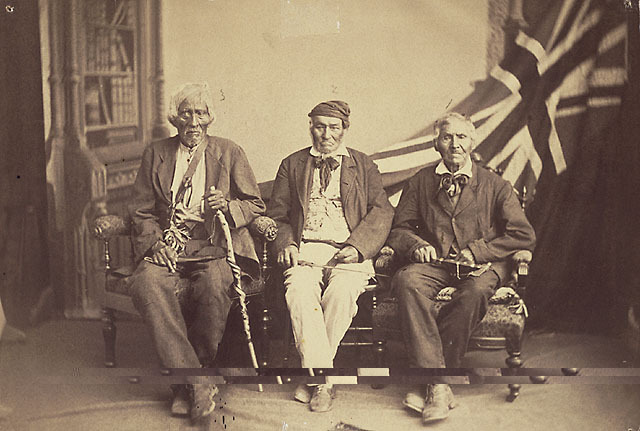 In return for relinquishing most of their territory and settling on reserves, Treaty 7 offered financial assistance and agricultural settlement instructions to signing members of the Blackfoot Nation, including the famed peacemaker and chief Crowfoot and other members of the Blackfoot Confederacy, including the Piikuni (Peigan, Pikuni) and the Siksika. Red Crow did not attach great significance to Treaty 7. The Kainai had no concept of a “reserve,” having wandered for millennia in the pursuit of the bison to the Rocky Mountains, “the backbone of the world,” in their eyes. The land and animals did not belong to the people — they were created by Napi (“Old Man,” Creator) when the world began and could not be “surrendered” to anyone. Despite this, Indigenous signatories of the treaty had doubts soon after it was signed. The NWMP failed to stop of the slaughter of remaining bison by American hunters. As the herds disappeared, Red Crow looked ahead, accepting the reality that they were gone. While other chiefs clung to the old ways, Red Crow persuaded the Indian commissioner to let his people move south to the Belly River to take up farming. Red Crow continued to battle with Canadian bureaucrats after signing Treaty 7. He was critical over rations, boundaries, encroachments on territory and the Canadian government’s broken promises. Red Crow used diplomacy and patience to negotiate the reinstatement of the Sun Dance, after it was forbidden under Canadian law. Though the Sun Dance was not re-instated until 1951, his effort to save an important element of the Siksikaitsitapi culture from destruction was a hallmark of his life, and his contribution to Indigenous cultural and political freedom. Red Crow crossed the Belly River for the last time on 28 August 1900. When he did not return, his wife, Sitting Before (also known as Longtime Singer), went looking for him and found him collapsed near the edge of the river. Red Crow’s identity was influenced by the tumultuous period in which he was born, which was a time of great uncertainty and change for Indigenous peoples in what would become the Canadian Prairies. With the decline of the fur trade in the 19th century, and the demise of the buffalo hunt, the Blood tribe and Blackfoot Confederacy faced increasing pressures to adapt new modes of living and subsistence. When he settled on his reserve, the largest in Canada, under the conditions of Treaty 7, Red Crow pursued self-sufficiency for his community by introducing ranching and by also stressing the importance of education. He remained a strong proponent of Indigenous culture and beliefs. In the wake of the disastrous effects of diseases and other external demands, he was a calm and wise leader who contributed to stability during a time of tremendous political and economic change. Hugh A. Dempsey, Red Crow, Warrior Chief (Saskatoon: Western Producer Prairie Books, 1980). Keith A. Regular, Neighbours and Networks: The Blood Tribe in the Southern Alberta Economy, 1884–1939 (University of Calgary Press, 2009).